Gas or charcoal grilling has been linked to chemicals that cause breast, stomach, prostate and colon cancer, according to the American Institute for Cancer Research (although the risk is low). High-heat grilling can convert proteins in red #meat, pork, poultry and fish into chemicals called heterocyclic amines (HCAs) that have been shown to be carcinogenic. In addition, high temperatures can change the shape of the protein, thus irritating the body. The smoke may also cause cancer because of the polycyclic aromatic hydrocarbons (PAHs) found in the smoke. “PAHs form when fat and juices from meat products drip on the heat source. As the smoke rises it can stick to the surface of the meat,” say health experts at Dana-Farber Cancer Institute. This does NOT apply to veggies (good news)! – When using marinades ­ thinner is better. Thicker marinades have a tendency to “char,” possibly increasing exposure to carcinogenic compounds. – Partially cook meat and fish in a microwave for 60 to 90 seconds on high before grilling and then discard the juices. This will lower cooking time and reduce risk of causing smoke flare-ups. 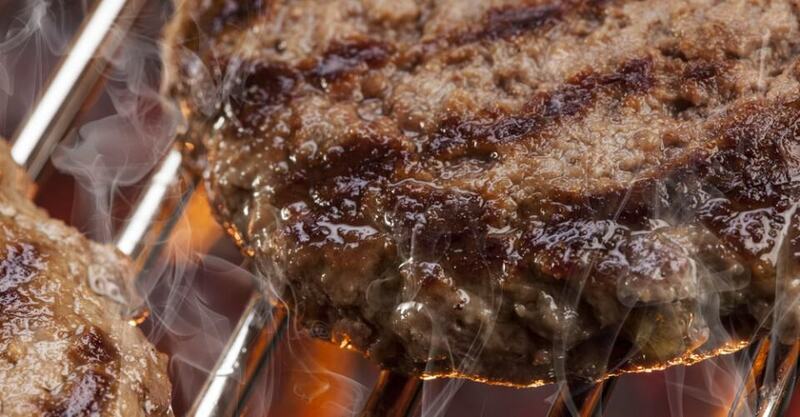 – Flip burgers often ­ once every minute for meat burgers ­ to help prevent burning or charring. – Place food at least 6 inches from heat source.